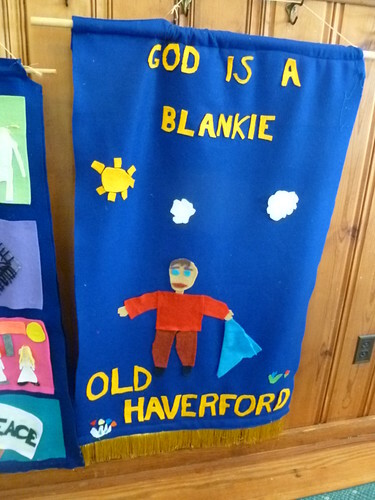 Back in 2006, on a road trip through the Northeast, we attended an unprogrammed Friends meeting in Providence, Rhode Island. 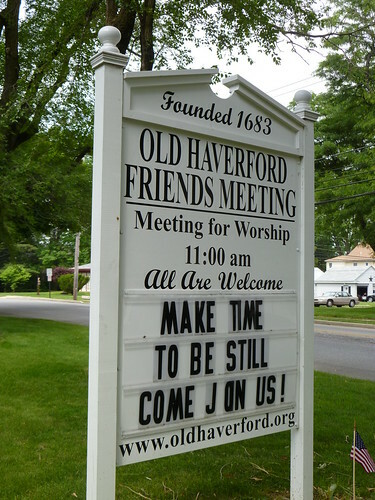 Our experience this morning at Old Haverford Friends Meeting in Haverford, Pennsylvania, was in most ways the same. This meeting is exactly 200 years older than Newberg Friends, which is considered old on the other side of the country. 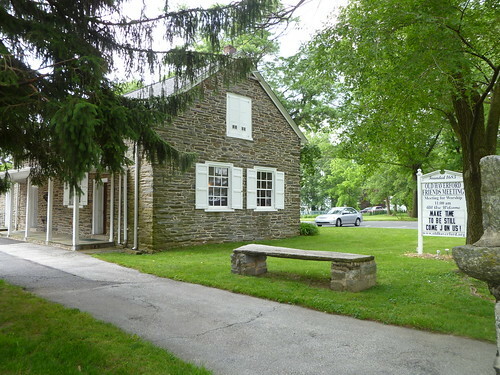 According to Wikipedia: Quakers have always reserved the word church to mean the body of people who make up the worshiping community: Quakers do not use the word church to refer to the bricks and mortar of a worshiping community. George Fox, an early Quaker, spoke of places of worship that have steeples as steeple houses, and those that do not as meeting houses. That would make Newberg Friends a steeple house. Or more accurately, a bell tower house. 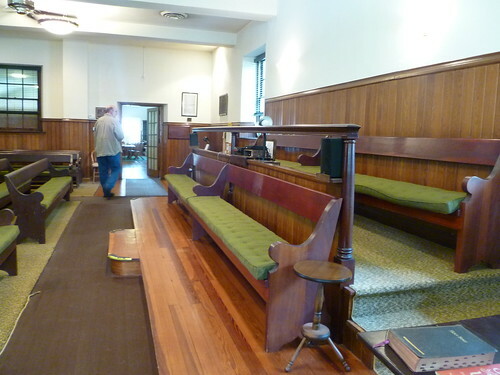 At 10:50, we entered the meeting house, where five people welcomed us. As we neared the startup time—11 a.m.—a young family of four came in, and they talked a little about their new baby, seven weeks old and how the adjustment was going. An older couple sat in front of us. At this point we numbered eleven. At exactly 11, one man and one woman left their seats to sit on the facing bench. or for us to share with others in the room. Ten minutes into the silence the door opened and in two women with two children entered. One of the children was dressed as Batman, mask and all. It was impossible to not look and smile. None of the children made a single sound. For a good five minutes! But then without fanfare, they all left with at least two of the parents. 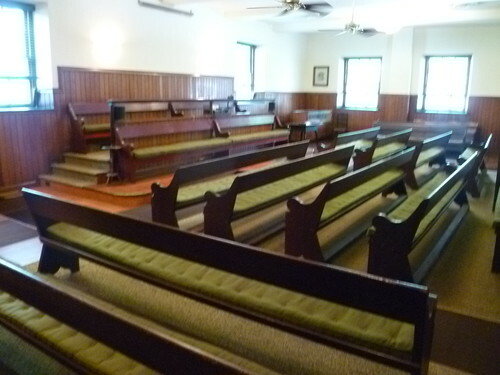 They had obviously learned it wasn’t okay to make noise in the meeting house, but there were no noise restrictions on the other side of the door. I was happy for the distraction, because an hour of silence in a very warm room with only the appearance of air movement (ceiling fans moved but barely) can make me ever so slightly antsy. At the stroke of noon, the “minister” stood up and shook hands with each person with a “Good morning!” A bit of business was shared and we were asked to tell where we are from. We told them we were from Newberg Friends Church in Newberg, Oregon, home of George Fox University. 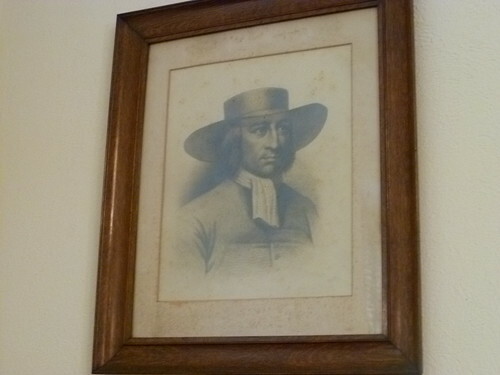 This picture of George hangs in their meeting house, so we had an instant connection. Even without Facebook. 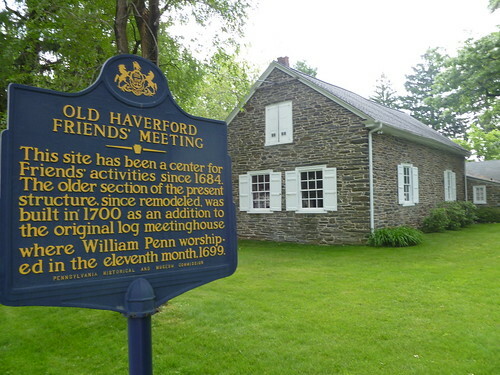 I used to work at Haverford High School when we lived out there. Funny you went there!